today was a big day. 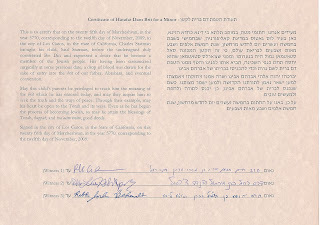 We all went to the Mikvah at the JCC, for the Bet Din to witness a Hatafat Dam Brit and Certificate of Conversion for Saul. 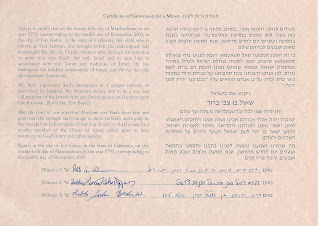 It's not a conversion, but it is a promise for the parents to raise him in a Jewish home. Then when he is 13, (at that oh, so rebellious age) he has to make the choice himself if he wants to be Jewish or not. I think it is pretty cool. He gets to wait till he is older, and HE makes the decision, not us. Anyhow, we went to the JCC, Saul and I went in the Mikvah, he was NOT happy about it, he said "Rabbi Josh is not swimming with us, and I do not have my floaties" But my folks and Sara were all there, and I got to be nekkid in the pool in front of a lot of people! woot! with Saul. my overall impression? the water was cold. on the way home, he said "I want to be in my bed, with my best blanket, and a bottle with milk in it"
which is exactly where he is now.